Some common painkillers may boost the odds of a heart problem. Use them wisely to lessen your risk. Ten years ago, the drug maker Merck pulled rofecoxib (Vioxx) off the market, following revelations that the popular prescription painkiller increased the risk of heart attacks and strokes. That action triggered a closer look at drugs in the same class, known as nonsteroidal anti-inflammatory drugs (NSAIDs). These drugs, which are widely used to ease pain, quell inflammation, and cool fevers, include over-the-counter drugs such as aspirin, ibuprofen (Advil, Motrin), naproxen (Aleve, Naprosyn) and the prescription drug celecoxib (Celebrex). Soon, all NSAIDs except aspirin were suspected of increasing heart attack risk. That prompted the FDA to mandate a warning about this side effect on all NSAID labels. Earlier this year, the agency considered dialing back the caution on naproxen, based on an analysis that showed a lower risk from naproxen compared with other NSAIDs. But a panel of expert advisers voted against the label change, so the warning remains the same for all NSAIDs. With the exception of aspirin, all NSAIDs may boost the risk of having a heart attack. Despite that decision, many cardiologists still recommend naproxen over other NSAIDs, says Harvard professor Dr. Elliott Antman, a cardiologist at Brigham and Women's Hospital and lead author of guidelines on NSAID use published by the American Heart Association (AHA). "From a cardiovascular standpoint, naproxen appears to have the least risk," he says, acknowledging that the evidence to support that claim is weak. But for a person at risk for heart problems who also has arthritis or musculoskeletal discomfort, naproxen makes the most sense, says Dr. Antman. NSAIDs pose a risk to the cardiovascular system for two main reasons. First, they change levels of substances in the blood that make clots more likely. A blood clot can block a narrowed artery in the heart, triggering a heart attack. Second, NSAIDs change blood flow in the kidneys, causing the body to retain more salt and water, explains Dr. Antman. That causes blood pressure to rise, which also boosts the risk of a stroke. High blood pressure also makes people more prone to atrial fibrillation—a rapid, quivering motion of the heart's upper chambers. 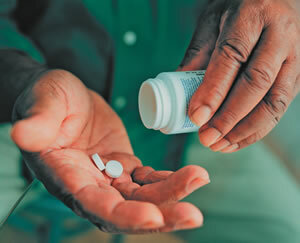 In fact, a recent study found a higher risk of atrial fibrillation in people who had taken NSAIDs during the past 15 to 30 days compared with people who had never taken NSAIDs. If you have had a heart attack or been diagnosed with a heart condition and you also have pain from an injury or a chronic condition like arthritis, follow the AHA's stepwise approach to treating pain. They recommend starting with a nondrug approach such as heating pads, ice, or physical therapy, if appropriate. Even if these approaches don't eliminate your pain, they may let you take a lower dose of a painkiller. Next, try aspirin or acetaminophen (Tylenol). Aspirin is the one NSAID that's actually good for the heart. But it can upset the stomach, lead to an ulcer, and cause bleeding in the digestive system. Acetaminophen appears safe for both your heart and gut. "But unlike NSAIDs, acetaminophen has no effect on inflammation, which is at the root of the arthritic conditions that plague many people," says Dr. Antman. Also, be aware that high doses of acetaminophen can damage your liver. Don't take more than 3,000 milligrams (mg) a day, keeping in mind that over-the-counter pills may contain 325, 500, or 650 mg of the drug. It's also found in cough, cold, and flu products, so check labels carefully. The next choice is naproxen, which is available over the counter and in higher doses with a prescription. Other options include drugs similar to aspirin, such as salsalate (Disalcid) or choline magnesium trisalicylate (Trilisate). They're easier on the stomach than aspirin. But they don't quell inflammation as well, and their cardiovascular effects haven't been well studied. Unfortunately, some people take painkillers every day because they want to prevent discomfort. "That's a problem because it turns occasional use into chronic use," says Dr. Antman. No matter what you take, he advises, "use the safest drug at the lowest dose for the shortest period of time to control your symptoms."